If there is only one value, it applies to all sides. If there are two values, the top and bottom margins are set to the first value and the right and left margins are set to the second. If there are three values, the top is set to the first value, the left and right are set to the second, and the bottom is set to the third. If there are four values, they apply to the top, right, bottom, and left, respectively. In CSS 2.1, horizontal margins never collapse. Two or more adjoining vertical margins of block boxes in the normal flow collapse. The resulting margin width is the maximum of the adjoining margin widths. In the case of negative margins, the maximum of the absolute values of the negative adjoining margins is deducted from the maximum of the positive adjoining margins. If there are no positive margins, the absolute maximum of the negative adjoining margins is deducted from zero. Note. Adjoining boxes may be generated by elements that are not related as siblings or ancestors. Vertical margins between a floated box and any other box do not collapse (not even between a float and its in-flow children). Vertical margins of elements that establish new block formatting contexts (such as floats and elements with 'overflow' other than 'visible') do not collapse with their in-flow children. 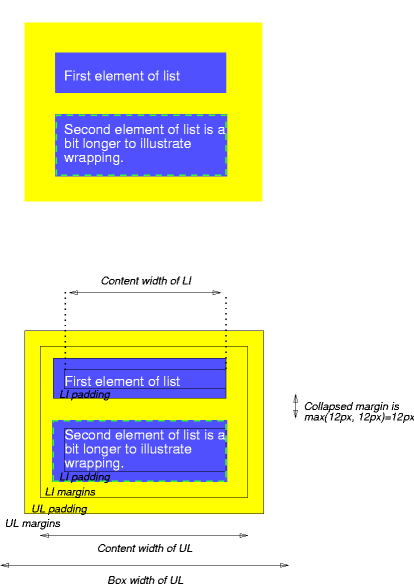 Margins of inline-block elements do not collapse (not even with their in-flow children). An element that has had clearance applied to it never collapses its top margin with its parent block's bottom margin. The bottom margin of an in-flow block-level element is always adjoining to the top margin of its next in-flow block-level sibling, unless that sibling has clearance. The top margin of an in-flow block-level element is adjoining to its first in-flow block-level child's top margin if the element has no top border, no top padding, and the child has no clearance. The bottom margin of an in-flow block-level element with a 'height' of 'auto' is adjoining to its last in-flow block-level child's bottom margin if the element has no bottom padding or border. When an element's own margins collapse, and that element has had clearance applied to it, its top margin collapses with the adjoining margins of subsequent siblings but that resulting margin does not collapse with the bottom margin of the parent block. 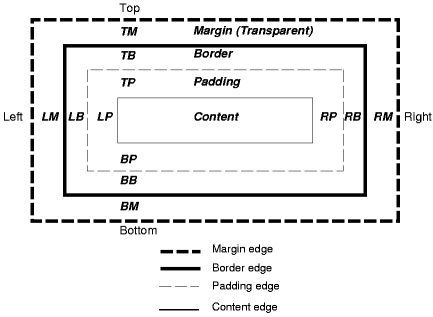 Collapsing is based on the used value of 'padding', 'margin', and 'border' (i.e., after resolving any percentages). The collapsed margin is calculated over the used value of the various margins. Please consult the examples of margin, padding, and borders for an illustration of collapsed margins. If there is only one value, it applies to all sides. If there are two values, the top and bottom paddings are set to the first value and the right and left paddings are set to the second. If there are three values, the top is set to the first value, the left and right are set to the second, and the bottom is set to the third. If there are four values, they apply to the top, right, bottom, and left, respectively. If there is only one value, it applies to all sides. If there are two values, the top and bottom borders are set to the first value and the right and left are set to the second. If there are three values, the top is set to the first value, the left and right are set to the second, and the bottom is set to the third. If there are four values, they apply to the top, right, bottom, and left, respectively. The 'border-color' property can have from one to four values, and the values are set on the different sides as for 'border-width'. The 'border-style' property sets the style of the four borders. It can have from one to four values, and the values are set on the different sides as for 'border-width' above.